Got heel pain, or commonly known as Plantar Fasciitis? Confused about everything you’ve read so far, but still don’t know where to start when it comes to exercises? If that describes you, you’re not alone. That’s why in this article, we’re going to outline a step-by-step plan on how, and exactly which, exercises you should be performing to help with your Plantar Fasciitis pain. Why stretching the foot itself may not be the best thing to do, regardless of what you’ve heard. Why strengthening the foot muscles may be better than stretching. This one muscle increases the chances of getting Plantar Fasciitis by 8 times. You’re going to learn how to self treat this muscle to help with heel pain problems. How long you should actually stretch, and how long it’s actually going to take to see results. The answer may surprise you. You’ll discover why muscle knots may be the real source of your pain, and learn the exact techniques to treat them. How Important are Heel Pain Exercises for Plantar Fasciitis? I get asked this question a lot. The reason is because everyone assumes that simply icing your foot, getting some Ultrasound, taking some anti inflammatories and getting fit with plantar fasciitis inserts will magically cure all forms of Plantar Fasciitis. The reason most people know about these treatments is because they’re ‘easy’ to do. Some of them, like plantar fasciitis insoles, are often the first line of defense when it comes to heel pain. However, they sometimes may not work. Stretches for foot pain doesn’t just involve the feet. They also involve the calves, hamstrings and even the low back as part of a heel pain solution. Strengthening is focused on the small muscles of the foot, in addition to calf strengthening. Strengthening may actually be more important than some of the stretches that we’ll go over. Trigger points and self massage aren’t really ‘exercises’. However, they are a crucial piece of the puzzle for some of you to add. That’s why we’ve included them here. Trigger points and self-massage aren’t really ‘heel pain exercises’, but they are a crucial piece of the puzzle. So I’ve decided to include them here. When Should You Begin Heel Pain Exercises? When to start an exercise program has more to do with your own personal situation rather than a specific rule. Do you have chronic heel pain that hasn’t gotten better in months? You can most likely begin exercises right away. Your only issue may be on which exercises to start with. If feet exercises are painful, you may want to work on calf, hamstring or back stretching and strengthening exercises first. Did you just recently get Plantar Fasciitis? You may need to first work on modifying simple things, such as stopping the activity that is causing pain, such as standing too long or modifying your running. Figuring out the cause in the beginning is one of the easiest ways to stop the aggravating factor and giving yourself time to heal. If the pain goes down, then you can begin your exercise program. Tried plantar fasciitis physical therapy exercises in the past but found that they didn’t help? If this describes you, then you’ll get a lot out of this article. We’ll go through each exercise component, explain why you need to do it, and then demonstrate each one. Whether you are stretching the muscles in the bottom of the foot, calf stretches for plantar fasciitis, or the hamstring muscles, there really is no proven amount of time that one should hold a stretch to be effective. You should stretch to the point of comfort. You don’t need to feel heel pain when stretching. The different studies had different time frames for stretching. However, the stretches were for different body parts. For example, stretching the toes required only 10 seconds of stretch, repeated 10 times. The calf and Achilles stretching was done for 20 seconds, repeated a few times, to stretching just once at 3 minutes. Both produced similar results. All the above is again, just a generalization. The main thing to learn is that the way YOU stretch will be based on your own individual preference. However, it’s also comforting to know that there isn’t any research that says you are wrong when trying to get relief through heel pain exercises. Should You Feel A Stretch In the Exact Area of Pain at the Heel? When most people think about stretching their ‘plantar fascia’, they actually believe that they are stretching this structure. However, the real stretch is for the small intrinsic muscles of the foot and not necessarily the fascia itself. The fascia is strong and similar to a ligament. It has no elastic properties. You aren’t going to be stretching a ligament, so don’t look at stretching as something that affects it. It doesn’t. It’s for this reason that you should focus on getting a gentle stretching near your toes. Even that stretch has it’s limitations, as i’ll explain shortly. If for some reason you feel a pulling and pain in the area of the plantar fascia insertion when exercising with plantar fasciitis, you are probably overdoing it. Most research studies use longer time periods, such as 4 to 12 weeks. That doesn’t mean it’s going to take you 12 weeks to see benefits. You aren’t going to be stretching for weeks with no change, and then one morning, magically wake up with no pain. The results are gradual. There are going to be good days where you are sure that the stretching is helping. And then there are going to be days when you think that the stretching is actually doing more harm than good. The results are not going to be consistent. However, be patient and focus on the process and not the outcome. That’s hard to say to someone that is in pain, but if you are looking for a quick fix, the stretching may be a disappointment. Be consistent with your heel pain exercises. Focus on stretching every day. Reflect back on your stretching to see if it’s helping, whether it’s making things worse, or you just don’t feel like it’s doing anything. Then change it up. Add more sets, stretch for longer or shorter periods of time, etc. It may not be the answer you want to hear, but it’s the harsh reality. Don’t quit too soon (unless of course you go through every day for a few days with more pain after you stretch! ), don’t be afraid to change up the stretching, and focus on adding stretching as a daily habit. How long it will take with heel pain exercises will also depend on how long you’ve had the problem. A study looked into which factors (age, weight or how long one has had plantar fasciitis) were able to predict successful treatment outcome. The study found that age and weight was not associated with treatment success, but length of time with heel pain did. In this section, we’re going to go over each stretch that you can do for plantar fasciitis. You may not need to do every single exercise, or you may find that you need to do all of them. 1. When you first wake up, try moving your ankles up and down. While lying down, slowly point your toes towards your head and move your ankles so that your toes are pointing towards your head. Hold this position for 10 seconds. Slowly bring your feet back down to neutral position. Rest 5 seconds and then bring your feet up again, holding it for 10 seconds. Do this about 3 to 5 times. 2. Sit on the bed, being careful not to put your affected foot down. Take your affected foot and cross it over your other thigh. Hold your foot with your hands and gently stretch back your big toe. Do this for 10 seconds, rest for a few seconds and repeat again 10 times. Then repeat again with the next 2 toes. After you finish that, repeat again with the last 2 toes. 3. Place feet on the ground. Do a calf raise. Repeat 10 times in a slow and steady manner. Make sure you squeeze your calves when you raise your heel. 4. Slowly stand up, making sure you put most of your weight on the pain free foot. Slowly begin shifting weight towards the other foot. After doing this for a few days or weeks, you should begin noticing that you are able to make this shift faster without pain. Note: Sitting and stretching each toe can also be done during the day, especially if you’ve been sitting for a long period of time. Make a note of the times that your feet are painful after sitting for long periods of time. Add the toe stretches at that time. Over time, make sure you note whether the number of painful sessions reduce, or the amount of time you can sit without pain increases. This is a sign that things are improving. 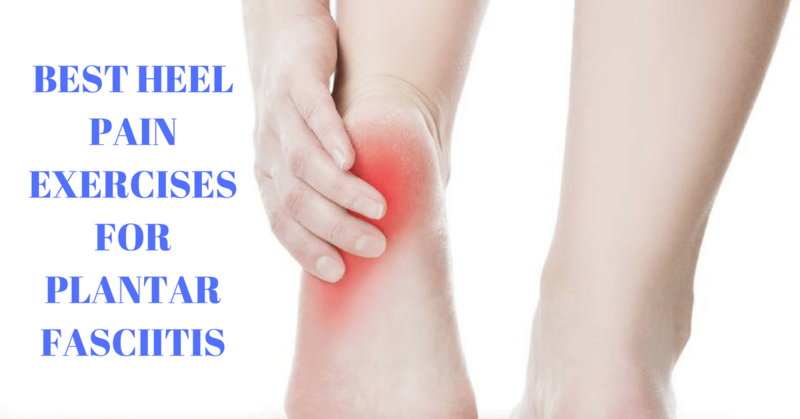 This article is specifically talking about heel pain exercises that are for pain that is primarily coming from Plantar Fasciitis. This type of heel pain is generally the most common type out there. However, there can be many other causes of foot pain. If you realize that the foot contains 26 bones, 33 joints, 107 ligaments, and 19 muscles and tendons, it’s not hard to see how many different structures and areas can be damaged. For 80 % of you, the stretches we just covered should help. If they don’t, you may want to stop them and begin strengthening exercises instead. Without getting into specific conditions, let’s use another diagnosis as an example. Tendinopathy (or commonly called Tendinitis) can occur in the tendon that helps flex the big toe. This condition can also sometimes feel like plantar fasciitis pain. With this ‘Flexor Hallucis Longus’ tendinopathy, pain is aggravated by overstretching the toes up, or moving the ankle up in a dorsiflexion movement. Can you see what would happen if you were stretching your toes every day, just like in the previous stretching program? It would make this pain worse. In this case, some initial rest would help, and then gentle calf stretches and toe curls. I wanted to bring this up because there is no clear cut heel pain exercises that will ‘cure’ your pain. If the stretches help over time, then you probably have plantar fasciitis pain. If the stretches above make it worse, it’s probably something else. That’s just something to consider as you go through your exercises. If you find that stretching your toes up is not making your pain feel better, try stretching your foot down instead. Sometimes I’ve found that to be more effective in the long term. Stretching the calf muscles is probably the most important stretch you can do, even more so than the foot stretches. I believe it’s a combination of a few different things that produces the best results. However, adding calf stretches is equally important. 1. Time of stretch can vary. A study found that doing a stretch for 20 seconds and repeating it 5 times, and it all over again the same day (so 2 times per day) gave the same pain relief as doing the stretch for 3 minutes, 3 times a day. I prefer to stick to about 30 seconds and repeat 3 to 4 times. Again, that’s just a suggestion. You will have to see for yourself how long of a stretch you need to hold to see results. 2. To stretch the calf, you will need to do one stretch with the back leg straight, and one stretch with the back knee bent. This helps to target the 2 different muscles in the calves. However, I’ve noticed that some people may feel more of a stretch in one position and not feel anything in the other. You may need to change up your position to get a stretch, but if you don’t feel a stretch doing one of these, no matter how hard you try, don’t worry. Be patient and play around with your stretches until you find the right position. Check out the following video on how to stretch the calf muscles. 3. There are several times to do this stretch. You can add this to your morning wake up stretches, do them after sitting or standing for long periods of time, or do them at the end of the night. One thing to be aware of is to always remind yourself WHY you are doing it. If you do them after standing for a long period of time, ask yourself whether the stretch relieves any pain after doing it. Then ask how long this relief lasts. How long should you wait until you do these heel pain exercises again? By constantly answering these questions, you’ll better predict whether it’s actually helping. You may notice over the next few days that you can stand 30 minutes longer without discomfort. You may notice that you should be stretching every 3 hours to produce less pain through the day. If you aren’t monitoring what you are doing, you won’t know whether it’s helping, whether you need to do more, do less, or stop altogether. The #1 reason why stretching fails is not because stretching doesn’t work. It fails because we stop monitoring why we are doing it, and whether it’s actually helping. When my patients just do the exercise for the sake of doing them, they are more likely to forget one day and not do them again. Does Hamstring Tightness Affect the Plantar Fascia? The hamstring muscle is probably one of the most overlooked muscles when it comes to heel pain exercises, yet it also may be one of the most important. If hamstring tightness can increase the chances of getting plantar fasciitis, can treating plantar fasciitis affect hamstring flexibility? All this research into the connection between hamstring flexibility and foot pain has led me to add hamstring, and in some cases, low back stretching exercises into a plantar fasciitis treatment program. When holding a static hamstring stretch, hold for at least 30 seconds. Repeat 3 to 5 times. Dynamic stretching can be performed while sitting at work. Straighten out your leg over a 5 second period. Hold the leg in an extended position for another 2 seconds, and then lower the leg for 5 seconds. When holding the leg, concentrate on contracting your thigh muscle. As you perform the dynamic hamstring stretch, attempt to point your toes up as much as you can. This helps stretch the calf and bottom of the foot at the same time. However, judge the amount of stretch based on whether it is painful or not. Remember, you don’t need to go into pain when you perform this exercise. You probably heard a lot about stretches for the heel, or even massage. But most people don’t know much about strengthening the foot muscles. This article is primarily focused on things you can do at home. Strengthening exercises are something you should consider. Why should I Strengthen the Foot Muscles? In the bottom of the foot, there are many muscles, which we call intrinsic muscles. Some of these muscles are involved in helping maintain a natural arch. You may have been told that you have flat feet or over pronated feet that may be causing your plantar fasciitis. If this is the case, there’s a tendency to start prescribing orthotics right away. For some of you in extreme pain, this can be a godsend. Some of my patients have noticed immediate pain relief from orthotics. Although orthotics may help, they may be leading to other issues over time. That’s why you should be focusing on strengthening your foot muscles, whether you get an orthotic or not. That’s where strengthening exercises can come in. Although most of the information out there points to the fact that strengthening heel pain exercises of the small foot muscles can help those with a fallen arch, it’s my experience that they can benefit just about anybody. Should I do strengthening with stretching or just by itself? Majority of the treatment strategies that you will use should be done in combination. That’s because research has always shown that one thing by itself is not the cure. Combining different treatments usually produce better results. Big toe extension exercise > 4 toe extension exercise > toe spread exercise > short foot exercise. However, if you are limited by pain, you may want to start off with the easier heel pain exercises. They still work the muscles, but not as much. That’s why they are usually a good progression. If you are suffering from pain, it can sometimes be frustrating to start off with the short foot exercise. With the toe spread exercise, it’s usually easier to do than the short foot also. It also appears to work the same muscles in the foot just as much. However, if you have bunions, you may not be able to do the toe spread exercises and move directly to the short foot exercises. Here is a video explaining all these strengthening exercises and some more. To get right to the exercises, start the video at the 4:10 mark. This form of strength training was designed for other areas, like knee tendinitis or Achilles tendinitis. The reason was that there was really no ‘inflammation’ occurring and that the area needed to have stress applied to it to make the area stronger. (I could go into detailed, complicated clinical words here, but this article is more about taking action with recommendations rather than learning). 1. The main idea is that people got better ’faster’ at 3 months compared to stretching. However, the results were the same after a year. The study finds that doing this got results in a quicker time, but I would recommend using this strengthening exercise in addition to some of the other strategies outlined in the article. 2. If you start to feel pain and this pain doesn’t reduce over several days, stop this exercise. There are a few people that may get more pain, or may not be yet ready for this exercise. 3. When you lower the foot, you’re basically ‘dorsiflexing’ the ankle and stretching the calf. The exercise effect may have more to do with this than the strengthening component itself. I’ve found that calf stretching to be one of the most effective stretches for heel pain. Just note that there is a stretching component in this exercise, which may be the real reason it works! 4. You have to be consistent to see results. You need to perform this exercise 3 times per week for several weeks to see any results. Also remember to use this in addition to the other stretches. This article will provide instructions on how to target trigger points in the calves and the feet. If you would like to learn more about trigger points in general, check out our article by clicking HERE. Here’s a video I did that summarizes what a trigger point is. Trigger points, also known as muscle knots, are not only at the site of your plantar fascia pain. The first step is in identifying exactly where in the calf muscles a trigger point is. Press into the spots in the calves and see if any of these spots refer or increase pain in the plantar fascia. Once you find the spots, gently press into it for several seconds (anywhere from 10 second to a minute) and notice if the referred pain begins to disappear. Then it’s time to move on to another spot. It’s important not to tense up while you are performing your self trigger point treatments. Deep self massage can also be effective in targeting the calves. However, be forewarned that you will most likely be more sore during the first few times in doing this. However, if you’re patient, the deep massage can be really helpful in loosening up the muscles. There’s a bit of an overlap with trigger points (finding a spot and holding pressure there) and deep massage (sliding over the entire muscle). I always recommend trigger points first. If you begin to notice some improvements, then you can progress to deep tissue massage. It’s a natural reaction to start poking around the foot for trigger points first. However, this usually leads to more discomfort and pain. The trigger points in the foot are located in thicker and deeper muscles to the plantar fascia. That’s why most people progress too quickly here. They try to press harder to get to the spots. This usually leads to more discomfort and pain. Most of my patients then get frustrated and quit before seeing any benefits. That’s why foot trigger points should be done slowly and cautiously. You can use any small ball to help with your self treatments. Is there an Order in Which To Do The heel pain exercises? Majority of the time, that is the proper progression to go through with your exercise program. So let’s take a look at each one specifically so you can develop the right program. As we’ve already outlined, muscle knots are responsible for keeping a muscle contracted and tight. If you don’t address these first, stretching will not work. However, some of you may not have trigger points. It’s best to look for trigger points in the calves and the foot muscles. Sometimes, I recommend going all the way up to the glute area. After you treat the trigger points, you should notice some initial improvements in your pain. Your leg may feel ‘lighter’ than the other side after your self treatment. You may feel less pain. Or you may feel looser. I usually add stretching exercises for the calves right after the self trigger point treatments. It’s important to begin doing these as soon as you can. Some of you may want to stretch the foot muscles also, especially if you wake up in the morning with pain, or get pain after sitting for a long period of time. However, I’ve already gone over the situation where stretching the toes up may sometimes lead to more pain, or may result in seeing no improvements. Just be aware of this. Stretching the hamstrings is also something that’s important to add to your program. As we’ve discussed, these can either be static stretches that you can do at home, or dynamic stretches that you can do while sitting at your desk. These are usually started after you’ve been consistent with your trigger points and stretching. I usually progress someone to proprioception exercises once you notice improvement in pain for 3 days straight with the trigger point and stretching program. Note that you don’t have to be pain free. You just need to notice some improvement over 3 steady days. There are 2 areas to strengthen: the feet and the calves. Which ones do you do first? With stretching, I always recommend starting calf stretching before attempting to stretch the feet. With strengthening exercises, you can work on both the feet and the calves at the same time. It really depends on how you’re going to respond. Foot strengthening is going to be a bit easier, since you can start with the easiest exercise and progress at your own pace. The high load strength training exercise may lead to some more initial discomfort.